TAMPA, FL – Bin52 by cindymadewhat, a jewelry line that features real brewing ingredients, has expanded to include pieces based off of commercial craft beer recipes. The bin52 by cindymadewhat shop includes a wide range of jewelry and accessories, including necklaces, rings, earrings, cufflinks, and key chains – all of which feature grains, hops, and other various brewing ingredients. Brewers and beer lovers have had the option to request pieces with custom recipes since the beginning of the year, but bin52 started offering pre-made commercial recipe necklaces just this summer. 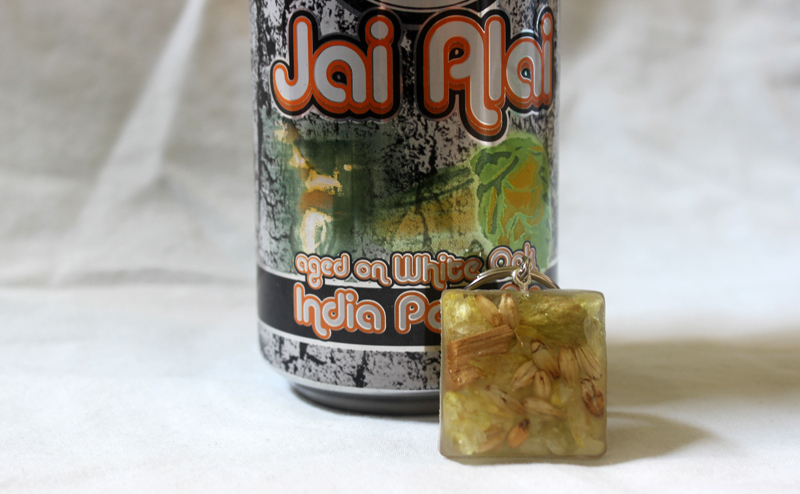 Currently the craft beer line includes necklaces and key chains with the recipes for beers such as Cigar City’s White Oak Jai Alai, Sierra Nevada’s Pale Ale, New Belgium Ranger IPA, and Bell’s Two Hearted. More recipes are being added weekly, and shoppers have the option to request their personal favorite commercial beer recipes in the form of necklaces or key chains. Some requested commercial recipes that bin52 by cindymadewhat has put into jewelry include Unibroue’s La Fin du Monde and Southern Tier’s Choklat. All bin52 by cindymadewhat pieces are available on Etsy at etsy.com/shop/bin52. For more information, visit cindymadewhat.com or reach out to Cindy on twitter or instagram at @cindymadewhat.